1. Preheat the oven to 220°C, gas mark 7. Tip the vegetables and cherry tomatoes onto a non-stick tray and roast for 10 minutes. 2. Meanwhile, place both the flours, chives, bicarbonate of soda, yogurt and milk in a bowl and bring together to form a soft dough. Knead briefly, then roll out on a baking paper-lined baking sheet to a 32cm round. 3. 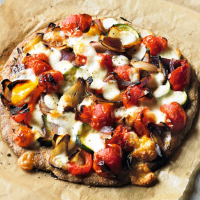 Spread the vegetables over the pizza base and scatter with the cheese. Bake for 20 minutes until golden and cooked through. Serve with salad.